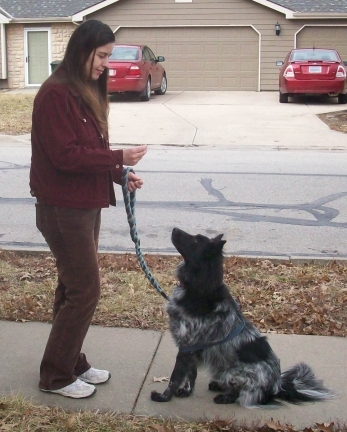 This entry was posted on February 9, 2013 at 8:15 am and is filed under Dog Training Tips. You can follow any responses to this entry through the RSS 2.0 feed. You can leave a response, or trackback from your own site. Wishing you all the success and looking forward to hearing how it all goes. These things do take time but I am glad you are using positive reinforcement. That sounds like a great plan, I hope it works well! Mum’s wondering whether to use something like that to distract me from Cats, yep, I get super interested when we see them! Hi! I just found your website while browsing indeed for information about reactive dogs 🙂 I have also bought this book, and while i’m waiting I was reading some reviews. Tjido my dog is the typical friendly dog off leash but a real barker and lounger on leash… so we’ll see how that goes! I hope to read your progress soon! Hello Dawn. It is me Francesca from The Online Canine! I love this post, anyways Feisty Fido is one of the first books I have ever read on leash reactivity. From my experience what is really important with dealing any type of “aggression” is to never get the dog to a point where he has to reacts. Always work below threshold, and build up. I know what you are going through, unfortunatly I live in Italy. BAT hasn’t arrived here yet(I have asked around millions of trainers about it.. I seem to be the only one who knows about it). The same with LAT, and other ways with dealing with reactivity. So I pretty much have to do everything myself. PLUS most parks in my area people leave their dogs off leash so there is no way to work with counter conditioning in a more natural enviroment. Keep on doing what you doing. Teach coping skills, and on and off arousal games. Prevention, and management is the key!! ps Check out the book Control Unleashed it is really good!! Thanks again, Francesca. 🙂 I will check out that book.